Hard swingin' modern bebop trio with original arrangements of standards. 3. Nod to C. C.
old classics done the “old” way. 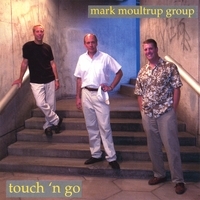 With each new recording Mark Moultrup extends his musical boundaries. On this venture, the intrepid pianist/vocalist has included more vocals than on his last recording. And this stretch of his vocal cords is especially rewarding on the relaxed and understated "East Of The Sun." For the most part, the vocals are rendered in a mature, knowledgeable style made evident by his creative improvisational phrasings. There is no mistaking Mark's selection of tunes. He is his own best producer, and to hear his unique rendition of Benny Golson's "Along Came Betty," and the use of his lower register on Ogden Nash's "Speak Low" lyric embellished with a dollop of bass clarinet, is music to the ears. On sections of “If I Should Lose You” and "Happy Face" the trio is augmented, but not with horns up front. During these moments his voice is another frontline instrument, and is particularly engaging when he scats along with the ever-efficient arpeggios of his right hand. Bronislau Kaper's "Invitation," Joe Henderson's theme song, is given a two-fisted, even-handed approach, if that's not citing too many fingers. For this tour de force, Mark's full use of the piano, his incredible technique is set free here, and this may be his real forte. As always with a Mark Moultrup recording, there's a delightful intelligence at work, an intuitive feel for his sidemen, most notably here–drummer Bob Harsen and bassist Nick Callandro. Review written by Herb Boyd. Herb Boyd is the author of several books on the history of jazz in Detroit, including "Who's Who in Detroit Jazz" with Leni Sinclair and "Jazz Space Detroit" with Barbara Weinberg-Barefield, and is currently working with Yusef Lateef on his autobiography. He's also been a contributing writer for the Village Voice, Jazz Times, and other music publications. then 2bl X up tempo swing. Piano solo – strong drums throughout. Straight ahead medium be bop, piano solo, short bass, drum interlude, nice vamp out. Marks’ early music experiences include studies with, then working with Marcus Belgrave. vocal accompanist with many artists including Mike Stern, Pancho Hagood, Larry Smith, Smokie Robinson, Eddie Kendriks, David Ruffin, Leslie Gore, and in the theater for touring companies of "Grease" and "Showboat". His original compositions are on his own CDs, promo spots, children’s CDs, and were featured in the Fox Sports Awards Show 1999, Fox Sport Network. work in area jazz clubs. Berklee graduate has performed with Randy Brecker, Frank Gambale, Bob Shepard, John Patitucci, Peabo Bryson, Ernie Watts, Brian Bromberg, Paul Butterfield, Richard Elliot, Melissa Manchester and the Broadway production of Bob Fosse’s “Big Deal”. Bob conducts percussion clinics, and endorses many lines of drum gear. Billy Branch, "Mr. Bo" Collins, The Velvelettes, Sesame Street's Bob McGrath, and Myron Floren. skills and fundamental skills of playing jazz in a group setting.